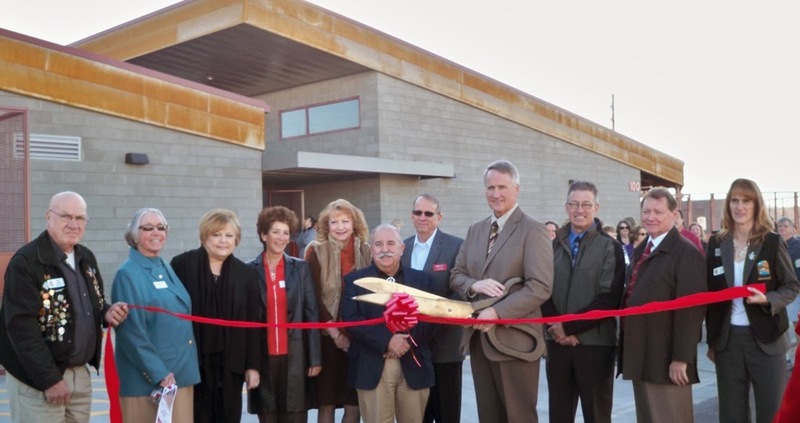 The Lake Havasu Area Chamber Ambassadors held a ribbon cutting for Mohave Community College celebrating the opening of its new art and industrial technology classroom building. Attending the ribbon cutting from left to right were back row Bob Keller, Mohave Community College Board of Governors’ president Dr. Julie Bare, former Mohave Community College Board trustee Kathryn Hodel, Mohave Community College Board members Dr. Judy Selberg, Phyllis Smith and Vance Miller, architect Michael Taylor, contractor Dan Withers Laura Prahl; front row: Mohave Community College Lake Havasu City campus Dean Dr. Nick Sanchez and Mohave Community College President Dr. Michael Kearns. The new 10,000-square-foot building will house art and heating, ventilation and air conditioning (HVAC) classes.